Assign the new Checkbook as the default. This is where the trouble starts. Where in the world can you set the default company Checkbook ID? The truth is, there is no single place to set the default Checkbook ID. You need to set it in several places if you want to use the same checkbook for all of the modules. Each of the following modules has a default checkbook setting. Now, you need to check to see if you have any checkbook default identified on the Vendor card or Customer card. When processing a receivables or SOP transaction, GP will look for a checkbook ID at the customer card first. If it doesn’t find one there, it will look to the Receivables Management Setup window or the Sales Order Processing Setup window, depending on what kind of transaction you are entering. For payables, it will look first to the Vendor card and then to the Payables Setup window. You should never have the same Checkbook ID on a card that you have on the setup window. Let the program do the work for you. Only put a separate Checkbook ID at the card level if you have an exception from your usual checking account. If you find that you do have a Checkbook ID set on the cards and want to remove it, you can use the Class ID to remove it and then roll down the changes. If you have too many classes to do it manually, or no classes at all, you can use SQL to remove the Checkbook IDs. Your update statements would look similar to those below if you wanted to remove them all. If you are using a third-party product such as Mekorma MICR or BGE Green Payable there will be other places where you’ll need to change the default. Take a look at the setup screens for any add-on products you are using and look for a Checkbook ID setting. If you find some other places where the Checkbook ID may need to be changed, please leave a comment and I’ll include it in the body of the post. Leslie Vail has been working as a Dynamics GP consultant for over 20 years. She began with version 1.0 in 1993. She has been a Microsoft Most Valuable Professional (MVP) since 2007. She presents at many partner and customer technical conferences and conducts training classes throughout North America. Leslie is recognized throughout the industry for her product expertise and contributions to the Dynamics community. She is the principal of ASCI, Inc., a consulting firm located in Dallas, TX. 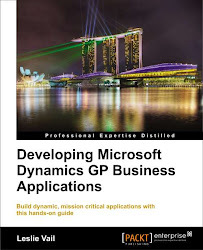 As a Microsoft Certified Trainer (MCT) her training expertise spans the entire Dynamics GP product line. She is an experienced trainer and teaches classes in Dexterity, Financials, Distribution, HR/Payroll, Integration Manager, Modifier with VBA, FRx, SQL Server Reporting Services, Report Writer, Crystal Reports, SmartList Builder, Integrated Excel Reports, Extender and System Manager. She serves as a Subject Matter Expert (SME) for the Assessments and Certification Exams (ACE) Team. She is a member of the US MCT Advisory Council. Dex.ini switches – my complete list! Installing the GP 2013 Web Client–roll up your sleeves!